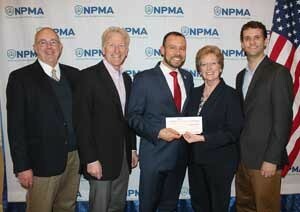 The NPMA’s Dr. Jim Fredericks receives the NPMA Foundation check from Copesan President Deni Naumann. From left are Dr. Jim Sargent, Copesan; Alfie Treleven, Sprague Pest Solutions; Fredericks, Naumann, and Dr. Bennett Jordan, Copesan. Copesan Services Inc. has contributed $10,120 to two key charitable organizations providing scholarship funds and research support to the pest management industry. The Copesan network marked its 15th year of giving to Pi Chi Omega and the National Pest Management Association (NPMA) Foundation for research through the annual Copesan Charity Raffle in 2016. 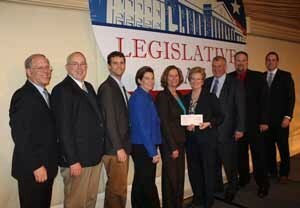 The checks were presented earlier this week during NPMA’s Legislative Day event in Washington. Copesan President Deni Naumann presents a check to Pi Chi Omega President Judy Black. From left are Russ Ives, Rose Pest Solutions; Dr. Jim Sargent, Copesan; Dr. Bennett Jordan, Copesan; Kim Kelley-Tunis, Rollins; Black, Naumann; Bryan Cooksey, McCall Service; Dave Ramsey, Copesan; and Aric Schroeder, Copesan. Sponsored by Syngenta, the 2016 raffle was held during Copesan’s annual conference in Scottsdale, Ariz., in February. This year’s event was attended by more than 330 members of the Copesan Partner network and pest management suppliers who raised $5,060 in just a few short days. Copesan matched this amount for a total donation of $10,120 to be equally divided between Pi Chi Omega for scholarships and the NPMA Foundation for research. Pi Chi Omega, a pest management professional fraternity, provides a number of $2,000 scholarships each year to deserving entomology students at universities across the country and around the world. The NPMA Pest Management Foundation has been providing grants for the research, development and refinement of pest management tools and techniques for more than 30 years.